Getting a glimpse at the future of assistive technology. Tomorrow, a very different (and futuristic) kind of racing championship will be taking place in Zurich: the Cybathlon. Developed by Eidgenössische Technische Hochschule Zurich (ETH Zurich) and National Centre of Competence in Research (NCCR) Robotics professor Robert Riener, this first-of-its-kind competition features athletes with disabilities piloting their respective cutting-edge assistive devices. 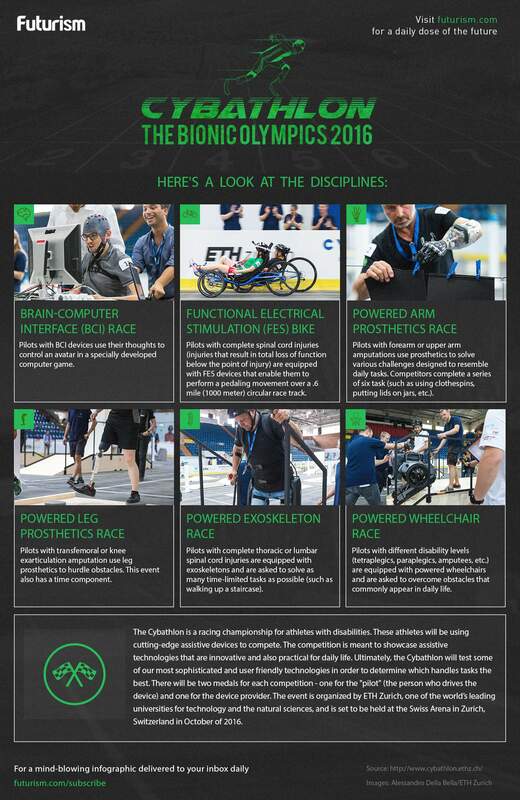 The Cybathlon has six major events or disciplines, each highlighting a particular assistive technology. The Brain Computer Interface (BCI) Race, which uses a video game for pilots with severe loss of motor function. The Functional Electrical Stimulation (FES) Bike Race, featuring pilots with spinal cord injuries and their non-motorized FES bikes. The Powered Arm Prosthesis Race, where pilots who’ve lost one or both arms complete challenges designed to mimic everyday tasks. The Power Leg Prosthesis Race, for pilots with transfemoral or knee exarticulation amputation wearing so-called “active” prostheses, which allow for more accurate movement control. The Powered Exoskeleton Race, an obstacle course of typical everyday tasks for pilots with complete paraplegia wearing motorized supports (orthoses). The Powered Wheelchair Race, where pilots on motorized wheelchairs compete on parallel tracks to complete a series of obstacles. For each of these disciplines, winning teams will be given two medals: one for the pilot or athlete sporting the device and another for the device provider. In addition to promoting the use of robotic assistive aids to the general public, ETH Zurich has stated that its main goal for the Cybathlon is to facilitate conversations, both between members of academia and the industry and between technology developers and people with disabilities. By bringing together these individuals from fields such as medicine, robotics, and communication who might never have met otherwise, the Cybathlon can encourage collaboration and innovation in a fun environment. Not only will athletes have a chance to compete using the very best assistive technology available today, they may get a chance to inspire and shape the best technology of the future.